Cracker Barrel Colby Jack Natural Cheese Slices - Cracker Barrel Colby Jack Cheese Slices are the perfect addition to any sandwich or burger. Made with wholesome pasteurized milk, these real cheese slices deliver amazing flavor to take your meal from ordinary to extraordinary. 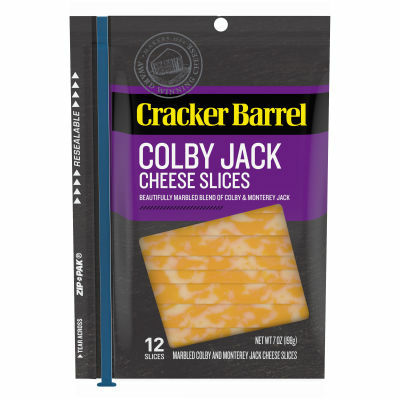 - Big Real Cheese Flavor - Enjoy the authentic cheese flavor of these Colby Jack slices. They come in a convenient resealable package to maintain freshness. Each of the 12 slices represents one serving with 60 calories in each. - Cracker Barrel Colby Jack Cheese, a delicious blend of Colby and Monterey jack, is perfect for tossing on any sandwich for a quick and easy lunch. From bag lunches to picnics, a slice (or two) makes for the perfect cheesy finish to any meal.